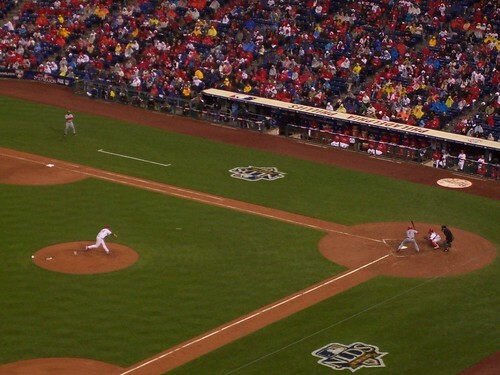 Did I ever tell you about the time I went to an NLDS game (with my Valentine) and Roy Halladay threw a no-hitter? In honor of pitchers and catchers reporting today, I give you 75 of the 350 pictures we took that night. View the whole set on Flickr, here. A Paean For the Fourteenth of February, A.D. 2011. Previous Post A Paean For the Fourteenth of February, A.D. 2011. Coach…thanks so much for this comment. It really means a lot. It’s been great to be in touch with Jay recently on facebook…I didn’t know he was at the Perfect Game…cool to think that two representatives from our old team were at these games cheering Roy on! boo to the Mets, always. Let me also thank you for everything you taught us back in the day. You made kids like us really appreciate what baseball is about, the integrity of the game, and how important integrity is in life. Jonny Calpas, Chris Cocca and all the rest of us were lucky to have you.